UNICEF report says child victims of violence rarely have access to justice. Most child victims of violence in Central and Eastern Europe and Central Asia find themselves unable to speak up and file charges in court, according to a new United Nations Children’s Fund (UNICEF) regional report launched today. “Everywhere around us, every day, children are affected by violence and abuse, yet only a fraction of them have access to a fair justice system able to make decisions in their best interests,” Susan Bissell, UNICEF’s Global Chief of Child Protection, said today at a discussion that launched the report in Brussels. “The right to access justice still seems, in the minds of many, inconceivable when it comes to children. 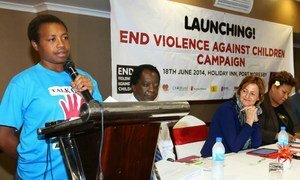 We urge governments and key partners to include children’s specific rights and needs in justice reforms at all levels,” she added. The event on ‘Prioritizing Access to Justice for All Children in Europe and Beyond’ brought together policy makers and legal practitioners to discuss challenges and ideas for a common way forward to ensure that all children, especially the most vulnerable, have access to fair justice. The report, Children’s Equitable Access to Justice in Central and Eastern Europe and Central Asia, aims to shed light on the tremendous barriers children face in seeking fair and effective solutions to put right the injustice and discrimination in their lives. In the same vein, the findings also cite notable progress in the administration of justice. Governments in the region are increasingly adjusting their procedures in courts and police stations to protect the rights of children, in line with international standards. Legal, paralegal and social support to children going through justice processes is increasingly being provided. Through child rights centres, children and their families can obtain information on avenues for redress, receive legal and social advice, be referred to a lawyer, doctor or psychologist. In some cases, they can receive direct legal assistance to initiate a judicial process. The report found that child rights violations in the region are also unreported or unchallenged in court. These include denying children with disabilities the opportunity to go to school or forcibly separating them from their parents. It also includes denying children from Roma or poor families in rural areas identity cards or social welfare benefits as well as discounting the best interests of children during custody issues in divorce proceedings. The report said that judicial decisions on these rights violations can set a precedent and have a life-changing impact on their future. Deeply entrenched social and cultural beliefs have made it unacceptable for children in the region to confide in an adult outside of the home about rights violations within the home, in school or in their community, much less bring a complaint through the judicial system citing fear of retribution for themselves and their families.